Get 5 sets for the price of 4 sets ($4.79 / set)! You need to add 5 items to your cart and the system directly deducts $5.99. Get 10 sets for the price of 8 sets & FREE SHIPPING! Get 20 sets for the price of 15 sets ($4.49 / set) & FREE SHIPPING! Buy Lucky Pack & SAVE $3, which includes 4 different patterns including Black, Light Gray Striped, Brown Striped, Brown Spotted. After 24 hours, we will restore the original price of $19.99, hurry up. The Cat-Paw Patterned Chair Sock is a fun and creative way to protect your wooden and hard surface floors from scratches made by furniture being moved on it. Ideal for children's bedrooms, or to bring a bit of fun and color to any room or office. 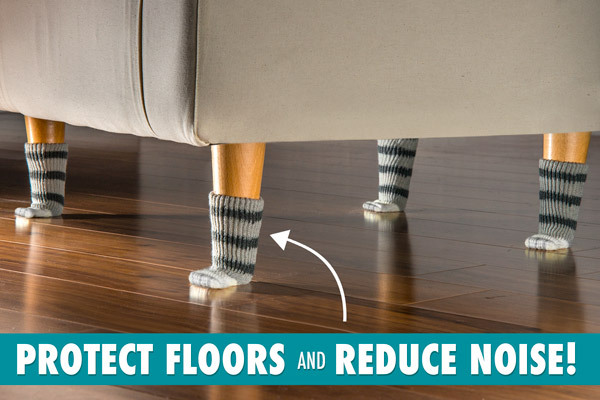 Protect floors and reduce noise. Each set includes 4 socks of the same style. 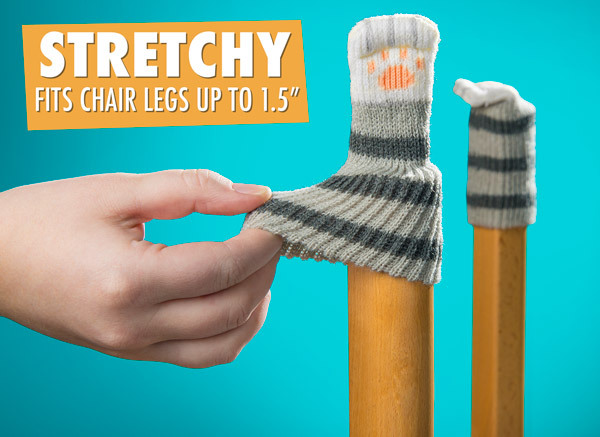 Easy to install and stretchy to fit most leg shapes (e.g. square, round, oval). Best for chairs with 3/4” to 1 1/2” diameter legs. Material: thick double-layer knit material (65% acrylic, 20% polyester, 10% elastane, 5% spandex). 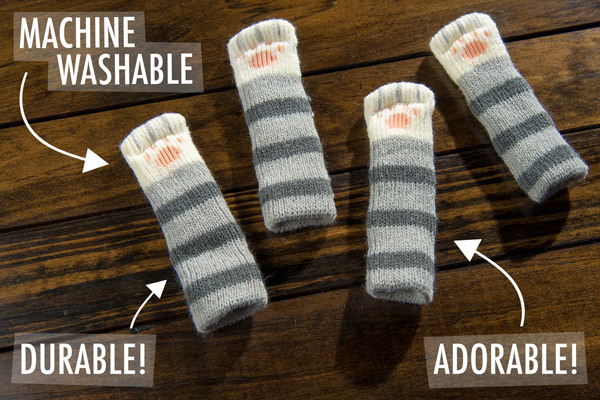 The adorable paws are machine-washable so you can always put your best foot forward. Cat Paw Chair Socks are versatile enough for most dining chairs. Made with stretchy synthetics like elastane and spandex, the hosiery holds up on chair legs thick and thin. Cats love to stretch, and so do these. THIS ITEM IS NOT SOLD IN STORES! GET IT WHILE SUPPLIES LAST! UPDATE: Due to a large increase in traffic, we’re currently running low on this product, so please hurry and place your order. Buying items online can be a daunting task, so we want you to realize that there are absolutely ZERO risks in buying something and trying it out. If you don't like it, no hard feelings we'll make it right.